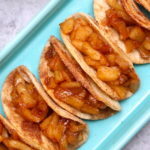 Super Easy Fried Apples with Homemade Tacos – delicious cinnamon sugary fried apples in a crispy and sweet taco, drizzled with caramel sauce, and then topped with whipped cream! The easiest dessert that comes together in no time. All you need is a few simple ingredients: Flour Tortillas, butter, cinnamon, sugar, apples, lemon, caramel sauce and whipped cream. It’s the perfect way to serve apple pie to a crowd! 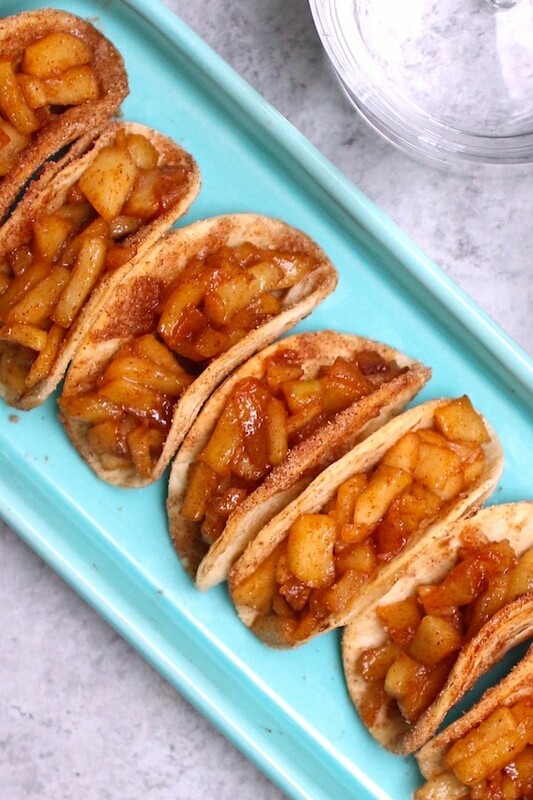 This Fried Apples with Homemade Tacos only take 15 minutes to make, and deliver mouthwatering apple pie flavor in each bite! It’s great for parties, family gatherings and holidays and is always a big hit! The best part is that you probably have most of the ingredients in your pantry. Fried Apples are easy to make and you can use them for Apple Pie Filling. It tastes much better and fresher. Once tried, you will never buy canned filling again! They keep well in the freezer for when you want pie filling. Preheat oven to 400°F. Set aside a 12-cup muffin pan. Cut 4 circles from each tortilla using a cookie cutter until you have about 20-25. Place the tortilla circles into a large mixing bowl and add 2 tbsp melted butter, 1/4 cup sugar and 1 tsp cinnamon. Toss until coated. Flip the muffin tin upside down. Place the tortilla pieces in between muffin cups and make them into a taco shape. Bake for 6 minutes.